Combines high speeds with low-voltage operation. 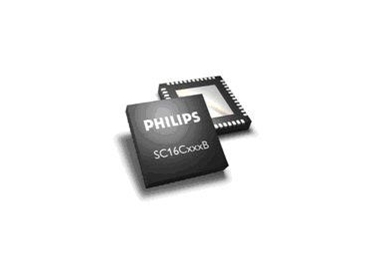 PHILIPS' range of advanced SC16C UARTs has been expanded with the release of the industry's smallest 4-channel devices. Now available in the ultra-compact, high-performance HVQFN package, they measure just 36mm², delivering board savings of as much as 90% compared with the industry's current smallest package size of 144mm². These quad UARTs are also available in compact 49mm² LQFP and LFBGA packages. The new devices offer manufacturers a simple way to reduce overall board space and decrease design time for applications ranging from mobile phones to high-definition TV. As part of our low power SC16CxxB range, the new devices combine high speeds with low-voltage operation to maximise data rates while minimising power consumption. They offer deep FIFOs, an extended temperature range of -45°C to +85°C and typical sleep currents as low as 50µA. Compatible with both Linux and Windows drivers, they are also pin and software compatible with industry-standard UARTs, simplifying design-in and speeding time-to-market. * Up to 64-bit receive and transmit FIFOs.